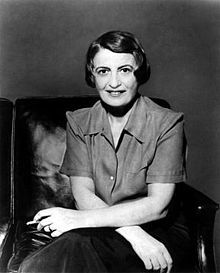 Knowing a little about Ayn Rand’s life prior to writing “Atlas Shrugged” will help shed some light on how she formed her objectivist philosophy and the story line for the novel. Ayn Rand was born in 1905, into a middle class family in Saint Petersburg, Russia. Her father was a chemist and a successful pharmaceutical entrepreneur. Rand taught herself how to read at age 6, and by age 9 had already decided she wanted to be a writer. Rand was in high school at the time of the Russian revolution of 1917. Her family fled to Crimea to escape the fighting. The rise of the Bolshevik party, and eventual communist victory, led to the confiscation of her father’s pharmacy, and poverty for her family. Rand finished high school in Crimea, and in her final year, learned about American history. She came to believe that America was the model of what a nation should be. After high school, Rand returned to Saint Petersburg to attend the University of Petrograd, where she majored in history, with additional studies in philosophy, and law. She graduated in 1924, and witnessed the disintegration of free study, and the take over of the university by the communist party. She then entered the State Institute for Cinema Arts to study screenwriting. In late 1925, she was granted a visa to visit American relatives. Although she told Soviet authorities that her visit would be short, she had vowed never to go back to Russia. She arrived in the United States in February 1926, entering by ship through New York City. After a 6 month stay with relatives in Chicago, she obtained an extension to her visa, and set out for Hollywood to pursue a career as a screenwriter. On Ayn Rand’s second day in Hollywood, Cecil B. DeMille saw her standing at the gate of his studio, offered her a ride to the set of his movie “The King of Kings”, and gave her a job. Her first job was as an extra in the film, but she soon became a script reader. During the next week at the studio, she met an actor, Frank O’Connor, whom she married in 1929. In 1931, Rand became an American citizen. Her first novel, “We the Living”, was completed in 1934, but was rejected by numerous publishers. It was eventually published in 1936. Considered to be the most autobiographical of her novels, it was based on her years under Soviet tyranny. In 1935, she began writing “The Fountainhead”. Not unlike her first novel, The Fountainhead was rejected by twelve publishers, but finally published in 1943. It made history by becoming a best seller through word of mouth just two years later. It also earned Rand lasting recognition as a champion of individualism. Ayn Rand returned to Hollywood in late 1943 to write the screenplay for The Fountainhead, but wartime restrictions delayed production until 1948. In 1946, she began writing her major novel “Atlas shrugged”. In 1951 she moved back to New York City to work full time on Atlas Shrugged, which was eventually published in 1957. This entry was posted in Book Reviews on October 5, 2013 by admin_z.